This Girl Scout cookie favorite inspired Samoa Milkshake is creamy, dreamy and packed full of yummy chocolate, caramel, and toasted coconut. 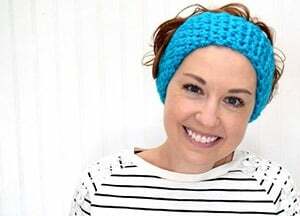 Well, a couple of years ago I was asked what I wanted my song to be at my funeral. You know, that song they play right before the pastor, or whoever, comes out and talks about how rad the dearly departed was? That song. What did I want that song to be? Because that song is supposed to remind people of who I was and why they took time out of their busy lives to say goodbye to ME. YUP. That song. At my funeral. Awesome. On a side note, can you totally believe that video was TEN years ago? I am getting OOOOLD. Ah, but at any rate, I am a HUGE fan of milkshakes. They’re easy to make, can come in amazing flavors and what in the world could possibly compliment french fries any better? Nothing. Add a burger in there and, dude, I’m in heaven. And a few days ago I was at the grocery store and I was leaving but coming right back. Have you seen the H-E-B stores in Texas? They are, like, grocery store heaven and they had some of the prettiest gigantic ferns out front and snagging 2 of them, they totally filled up the shopping cart. Couldn’t be having that because I need some space for not only my shopping list but the other fun things I find at my fave local grocery and so they were paid for, taken out to the vehicle and the cart pushed right on back into the store. On my way out the FIRST time this Girl Scout asked me “would you like to buy some cookies?” and I gave my standard “no thank you, but best of luck!” I had no cash and I had forgotten that they might have had a gluten-free version there at their stand but it was a no from me. 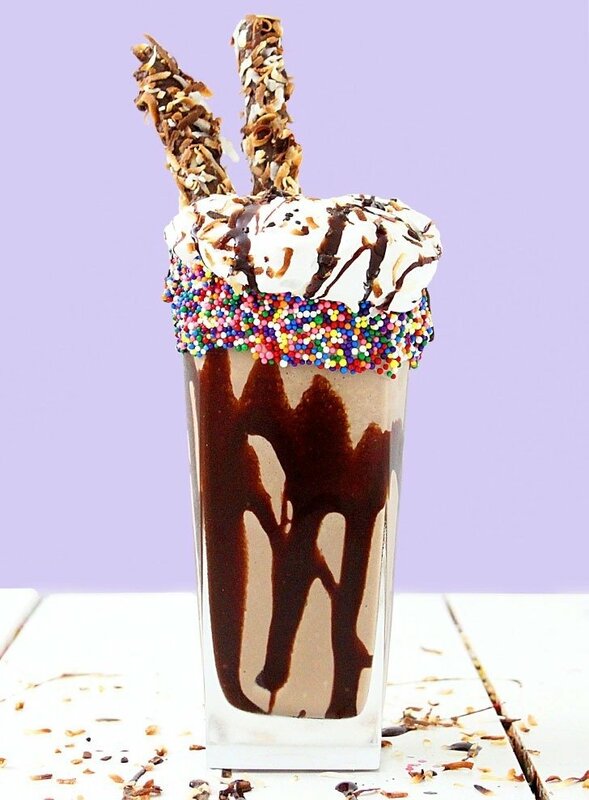 Which brings us to today’s recipe… the Samoa Milkshake inspired by the Girl Scout cookie that we’ve all come to know and love and I can’t eat because I’m Celiac and sadly gluten free :) But I totally REMEMBER (I think) what a Samoa tastes like and it was like a little bit of heaven. 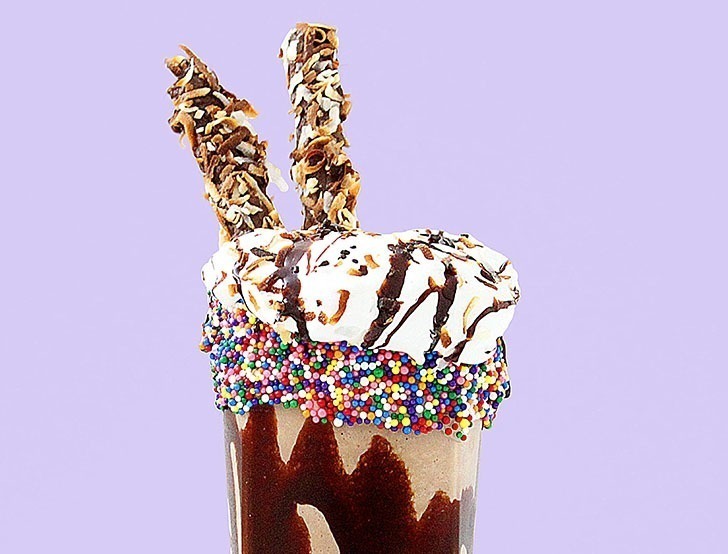 So today we’ve got this creamy, dreamy Samoa Milkshake recipe chock full of chocolate and toasted coconut and caramel and a little bit of bright and colorful sprinkles on the glass because it’s sassy. Just like the cookie saleswoman I passed by and had to pass up. This recipe yields 2 mondo Samoa milkshakes that will bring all the boys, and the girls, and then some, to the yard. Get ready for a chocolate treat that is amazingly lush and features the perfect pop of caramel and toasted coconut, just like its inspiration, the Samoa Girl Scout Cookie! Toast coconut, if necessary, on a parchment-lined cookie sheet at 400° for 10 minutes, or until golden brown. Remove and allow to cool. In a small saucepan, melt chocolate on low heat stirring constantly. When melted, turn off the heat and dip cookie sticks, if using, about halfway up. Immediately roll cookie sticks in toasted coconut and return to parchment paper. Place in the freezer to allow the chocolate to quickly set. If you don’t want to use cookie sticks (because you don’t have any on hand or because you’re avoiding gluten, you can also dip straws into the chocolate and roll in the coconut. It’s a fun treat to eat off of the straw as you drink the shake! Top the outer rim of your milkshake glasses in marshmallow creme, coating it well. You can also use a rubber spatula to help spread the crem onto the rims, if necessary. 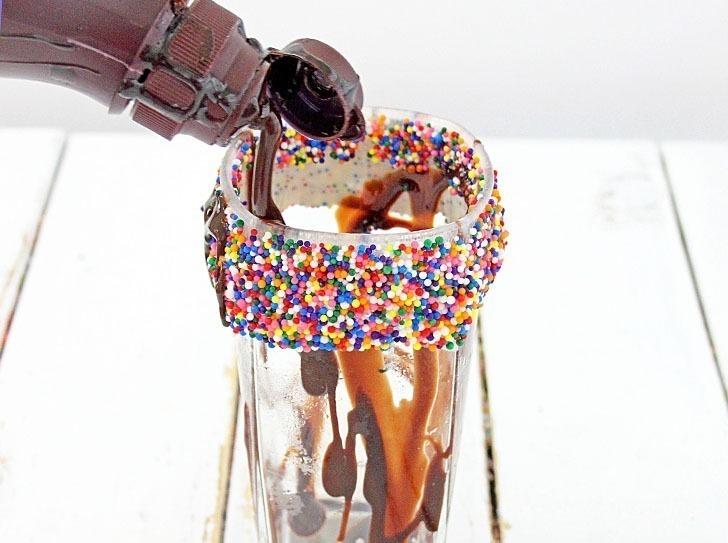 Dip the glasses in nonpareils then drizzle the insides, very heavily with chocolate syrup. Immediately place your glasses in the freezer next to your cookies or straws. In a blender add milk, ice cream, vanilla syrup and 2 tablespoons of chocolate syrup until well blended, creamy and thick. Place the blender jar in the freezer and allow the chocolate shake mixture to chill for about 10 minutes. 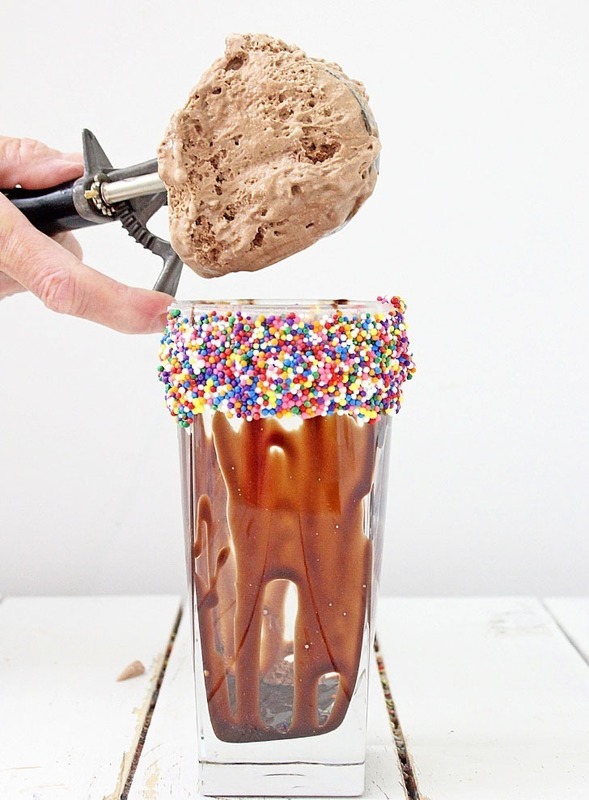 Remove everything from the freezer and pour the shakes into the glasses until full. Top with a healthy dollop of marshmallow creme and drizzle heavily with chocolate and caramel. Decorate with your cookie sticks or straws and sprinkle with more toasted coconut.